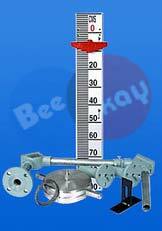 From our unit in Chennai, Tamil Nadu we are one of the chief manufacturers, exporters and suppliers of Float & Board Level Gauges. These gauges can be used to check the level of a fluid in an extensive non-pressurized space tank. The gauge is easy to read and is guaranteed to provide accurate and precise readings. Timely delivery of all orders is guaranteed.